You Will Feel The Difference From The Second You Walk In Our Kaukauna, WI Auto Shop! CarTech Auto Repair owner Mike Dietzen has over 35 years working in the automotive industry. It all began in early childhood tinkering with his bicycle and making minor modifications. He started working with his dad on the family cars, lawnmowers and anything that was in need of repair. Mike soon began collecting his own set of tools and at 15 purchased a 1966 Mustang which he restored—and still owns today! There was never a doubt that Mike would pursue a career in mechanics. While already tenured, Mike earned his degree in Automotive Repair at Fox Valley Technical College—all while working part-time at an independent repair shop. While in college Mike built a pro-street 1979 Mercury Capri which has since been featured in 5 national car magazines. After earning his degree Mike got a few years under his belt as a full time mechanic in independent shops and 2 Fox Valley car dealerships. In 1995 he decided to open CarTech Auto Repair—a business built on high standards and solid business efforts. 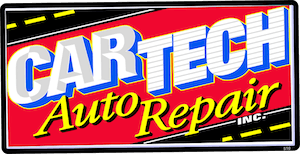 Today CarTech has 6 service bays and 3 tenured technicians—Mike with 35 years, Wally with 30 years, and Jeremy with 14 years in the automotive repair industry. We aren’t just an auto shop but a team who cares about our earth, our country, and the future of both. We are a green business and strive to do everything possible to preserve the planet. We buy our fluids, such as oil and antifreeze, in bulk to reduce the number of plastic containers used. The plastic, paper, and cardboard that we use is always recycled. The metal scraps removed from cars are taken to a scrap yard to be melted down and reused. We support local and American businesses by purchasing as many of our tools, parts, and shop supplies as we can from companies based in America—and companies who make their products in America. With children of his own, Mike understands the magic and excitement of Christmas for kids. This is why CarTech Auto Repair collects gifts each year for the local Toys for Tots drive. Each year our team and several of our generous customers gather hundreds of presents for Fox Valley kids who might not have anything under their Christmas tree otherwise. This is a tradition the entire CarTech family eagerly looks forward to each winter. We are grateful to our loyal customers many of whom we are serving multiple generations of. We are also proud to be the shop of choice for many Kaukauna moms in need of an honest auto shop they can trust to deliver quality repairs at reasonable prices. Thank you to the entire Fox Valley community. We look forward to serving you for many years to come!